Picture Search Results. page 1 of 23. (from page 1 of the 1968 Collection) This Red 1968 Mustang GT hardtop has a 390ci engine, X code (V2) 2 barrel carb, AC w/heat, C-6 automatic transmission, AM radio with 8-track player, power steering, power disc brakes, bucket seats with seat belts, spare tire & jack, fog lights, remote outside mirror, tinted glass, front and rear spoilers, and a Posi rear end with 2.78 gears. The front nose and hood are from a Shelby. (from page 1 of the 1968 Collection) Red 1968 Mustang GT hardtop, right front view. Those are Cragar wheels. (from page 1 of the 1968 Collection) Gulfstream Aqua 1968 Mustang GT/CS California Special hardtop owned by Arlie Moses and now Shane Mills. 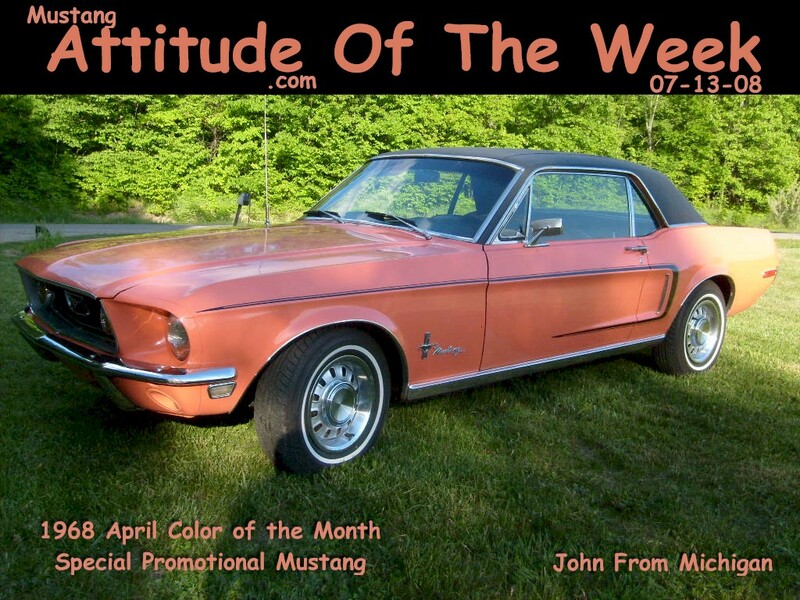 This was our featured Attitude Of The Week photo for 6-15-08. Options include the C-code 289ci V8 engine, C4 transmission, 3.00 open rear, air conditioning, power steering, and power disc brakes. (from page 1 of the 1968 Collection) Gulfstream Aqua 1968 Mustang GT/CS California Special hardtop, left rear view. For identification, the side air scoops have the letters GT/CS and there is a chrome California Special emblem over the side rear marker light. (from page 1 of the 1968 Collection) Okay what's different in this picture? Two things are different. The paint is lighter and its wearing a set of 10-spoke Shelby wheels. Arlie Photo-Shopped (tinted) the photo to more correctly match the shade of Gulfstream Aqua that's on the car. This is a difficult paint to photograph. Arlie also edited in the wheels to see what they looked like. That's much easier than physically trying them on! The only give-away on the editing is that both wheels have the exact same lighting. Arlie has since changed to the 10-spoke Shelby wheels for real. (from page 2 of the 1968 Collection) This Gulfstream Aqua blue 1968 California Special Mustang GT coupe is our Attitude Of The Month for December 2009 and is featured in our 2009 calendar. (from page 2 of the 1968 Collection) An additional shot of his Gulfstream Aqua 1968 Mustang GT/CS near the water.